Gunners took a narrow 1-0 lead into the second leg. Will Lethbridge scored the opening goal just after half an hour to level the tie. A direct corner from Rob Greenlaw found the far top corner to give the Wanderers the lead on aggregate. The third goal of the day came from another set piece when Anuwat Chirawat capitalised on a loose ball. The Woolpack Wanderers lifted the League Cup on Sunday morning with an emphatic 3-0 victory over the Garrison Gunners. It was the Gunners who had a slim advantage going into the second leg with a 1 -0 lead over the Wanderers but goals from Will Lethbridge, Rob Greenlaw and Anuwat Chirawat secured the first piece of silverware of the season for the Wanderers. Ahead of play, there were some concerns that the game would be ruined by the wind. The Isles of Scilly experienced some of the strongest winds of the winter season so far in the early hours of Sunday morning. The wind had eased a little before kick off and luckily changed direction before kick off. It still had an impact on the game but not as much as expected. A few key players away this week for both sides. 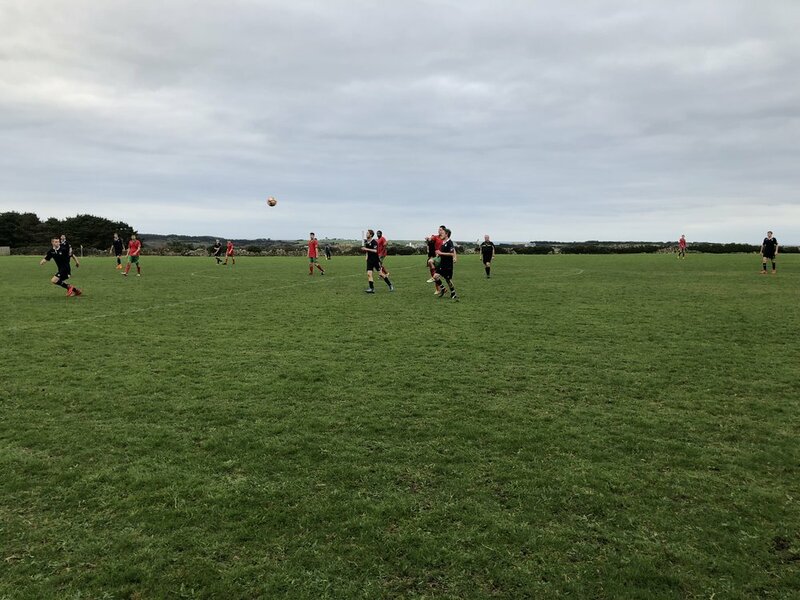 Due to the weather conditions, Gunners striker Adam O’Neill and Wanderers goalkeeper James Wignell were unable to travel down from Tresco. Gunners centre forward Joel Ware and Wanderers midfielder Jack Stone are both still in Thailand. Liam Greenlaw was unavailable for selection and Matt Simons was ruled out through injury for the Gunners. The Wanderers were also without goalkeepers Eugene Hogan and Kane Goddard. Sam James donned the gloves this week for the Wanderers. Free agent Joe Thomas was signed by the Wanderers and made his debut in midfield. Even with the number of absentees, both teams had a full eleven and substitutes. The Gunners won the coin toss and elected to play upfield (towards the Garrison Campsite). In very early stages there wasn’t much in the game with both sides attempting to move the ball around on the floor. There weren’t a huge number of clear-cut chances for either side early on. The best early chance came 10 minutes in when Rob Greenlaw found space down the left wing and pulled the ball back from the by-line. Will Lethbridge beat the defender at the near post and got a touch on the ball. Will St Pier in goal for the Gunners made a good save low down at the near post. Sam James was forced into a save from the edge of the area, which he parried before gathering. The Wanderers started to assert their authority on the match and pressed forwards. Being a goal behind from the first leg they knew they had to get off to a good start. They started to have a bit more possession and created a few chances from in and around the area. It would be the Wanderers who would get the opening goal just after half an hour. A dangerous ball was whipped into the penalty area from a corner. After the initial challenge, a goalmouth scramble ensued. Rob Greenlaw knocked the ball to the edge of the area, which ricocheted of a defender and fell to Will Lethbridge 8 yards out who side-footed into the back of the net to make it 1-0 to the Wanderers and 1-1 or aggregate. The Gunners only managed to carve out a few further chances that were either off target or dealt with comfortably by Wanderers keeper Sam James and the Wanderers didn’t have that many chances either. It was all square on aggregate at the break and all to play for! As the second half got underway the Wanderers pressed on and were looking the more dangerous of the sides. The Gunners were by no means being overrun but they were struggling to create many opportunities in front of goal despite Jack Handy’s runs and link up play. Will St Pier wasn’t tested too much in the early stages of the second half but as the game started to open up the Wanderers looked like the more threatening of the teams. Ultimately it would be another set piece that would give the Wanderers a 2 goal lead on the day and the lead on aggregate. The Wanderers were awarded a corner out on left. Rob Greenlaw curled the ball high into the box. The ball went through a crowded 6-yard box and went into the far top corner. The wind may have got the assist but regardless the Wanderers didn’t mind and deserved their lead. Frustration was starting to build for the Gunners and it seemed that just at the crucial moment they couldn’t capitalise. The third and final goal of the day would also come from a set piece. The Wanderers were awarded a slightly dubious free kick 10 yards out and to the left of the penalty area. The ball was put into the danger area and after challenges from both sides the ball fell to Anuwat Chirawat who headed into an empty net from a yard out to make it 3-0 to the Wanderers. In the later stages of the game, the Wanderers sat back and limited the Gunners to just a couple of half chances that either went wide or were dealt with by Sam James with ease. The Wanderers win the League Cup 3-1 on aggregate. Thanks to all for turning out and to Paul and Crockett for officiating. Also a big thank you to Gibbo for setting up the new goals. They’re awesome! As far as performances go, some fantastic ones this week. Central midfielder Dan Ware worked tirelessly alongside Lee Eaton for the Gunners in midfield. Jack Handy made some great runs and looked sharp throughout the game. Unfortunately, things didn’t quite go his way. Corey Graham also had a good game on the wing. Despite not having the busiest of games, stand in goalkeeper Sam James put it a solid shift in between the sticks for the Wanderers. He dealt with everything that came his way and his distribution was good. Russell Hutchins marshalled the defence and brought the ball out well. The entire backline did well in limiting the Gunners to half a dozen or so chances throughout the game. Joe Thomas put in a solid performance in the centre of midfield alongside Joe Greenlaw. This week the award goes to Wanderers Captain Rob Greenlaw! Organised the team from the word go, got on the score sheet and was heavily involved at both ends of the pitch. Six-A-Side in the Sports Hall, this evening, 6:30pm-8:30pm - £5 for the 2 hours. Back to league football next week! The Gunners have a 9-point lead and will be hoping to get some revenge on the Wanderers while the League Cup champions will be looking to close the gap. 10:30 KO – Sunday, 3rd February, Garrison Field, St Mary’s, Isles of Scilly.